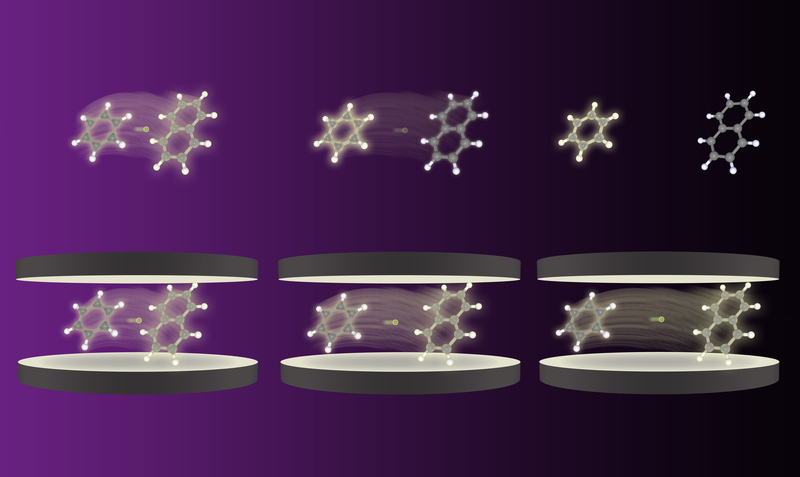 Hamburg scientists’ theory of polaritonically amplified energy transfer over long distances between molecules paves the way for a new level of chemical engineering and ‘spooky chemistry’. Scientists from the Theory Department of the Max Planck Institute for the Structure and Dynamics of Matter (MPSD) at CFEL in Hamburg have shown through computer simulations that the transfer of energy and charge between molecules can be drastically enhanced and controlled with virtual photons. This fundamentally alters the guidelines for chemical reactions and advances a new field of chemical control by non-intrusive methods acting at a distance. The clue is, that the controlled vacuum leads to novel states of mixed light and matter character, known as polaritons, so that even widely separated molecules are connected to each other by the fast and over long distances efficient light-character, very much like equipping two interlocutors with light signals.